In partnership with Las Vegas Metropolitan Police Department and the Nevada Department of Corrections, Las Vegas-based God Behind Bars supports family reunification and end generational incarceration this Halloween with the first-ever Trunk or Treat event on Saturday, Oct. 13 4 -7:30 p.m. at the Casa Grande Transitional Housing Facility (3955 W. Russell Rd). During this unique event, God Behind Bars will be reuniting, or sometimes even introducing, inmates and their families, allowing fathers to take their kids through a fun Halloween carnival, enjoy a catered dinner, go trick or treating out of police cars, and most importantly, participate in community restoration. 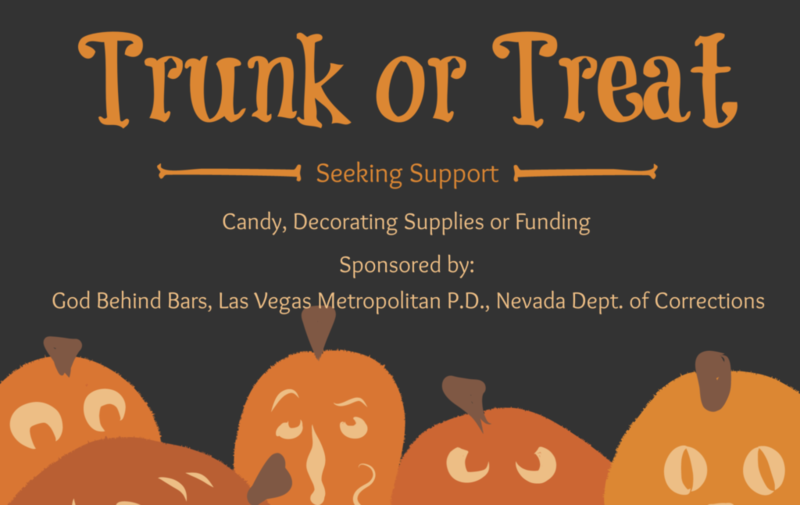 The Las Vegas community is invited to help sponsor this event by donating time, funds, candy, or decorating supplies by visiting www.gbbtrunkortreat.com. Most prisoners—as many as 92 percent of all incarcerated individuals—will be released back to society at some point, and 75 percent of them will return to prison within five years. God Behind Bars has successfully reduced the recidivism rate to approximately 15 percent of program participants through their unique approach that focuses on the physical, spiritual, and relational needs of inmates and their families – partnering with local churches and other faith based-organizations to bring dynamic, high-quality worship experiences into prisons with an average of 150 inmates per experience; programs reconnecting them with their families; addiction-based recovery programs to help prisoners confront and fight their hurts, habits, and hang-ups; a full re-entry process helping inmates find jobs, housing, and educational opportunities while integrating them back into their community with their family, friends, and church; and lastly God Behind Bars continues relationships with ex-inmates ensuring their practical needs are met moving forward on their journey. God Behind Bars provides family reunification through their events and spiritual teachings, and they also fight to end the cycle of incarceration by reducing the re-offending risk of recently released inmates and eliminate the probability of children of offenders becoming incarcerated. More than 85 percent of children of a parent who has been, or currently is, incarcerated will go on to be incarcerated themselves. Through events like Trunk or Treat, God Behind Bars aims to introduce police officers to these children in a positive light and environment, helping the children see that the police officers are for them, and not against them. More than 5,000 prisons and 2 million families need programs like God Behind Bars. Financial support is key to helping expand this ministry and share hope and new life with inmates and their loved ones around the country. With a monthly recurring donation of $54 God Behind Bars can provide a family with the necessary programs they need to get back on their feet. All donations to God Behind Bars are tax deductible. Your donation will go directly towards funding the family reunification piece of God Behind Bars, allowing inmates to reconnect with their families to end the cycle of generational incarceration.